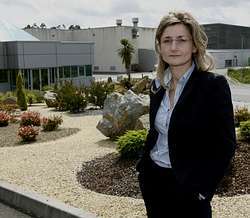 The company in Cerceda obtains biofuel and flour to make cement with the animal remains from Galician livestock farms. The crisis of the mad cow disease put them on the front pages, but animal residues are an old problem in the livestock farming sector. The EU demands a strict protocol when getting rid of animal residues such as the carcass of a cow or the residues of the cutting area of a slaughter house. Experts refer to this matter as a meat by-product. The company Gesuga, located in Cerceda, takes charge of managing these residues. -It is the rest of a process, although in our case we get a resource out of a residue. We submit the by-products to a process of boiling and dehydration, separating water from meat. Thus we get a mass that we call cracklings. We submit this element to a pressing from which we get fat that later on is used as biofuel. After the pressing process we obtain a solid matter that we transform into flour which is used in the elaboration of cement. -Do you also manage collection? -The stock farmer contacts with a telephone service which is centralized in Madrid. Via Internet we get all notifications produced in our community. Those data are derived to our transport logistics system and we go to the farm to take away the dead cow complying with hygienic-sanitary systems that guarantee the treatment of residues till their arrival at Cerceda. In the case of Ourense we count with a transference plant. -How do you prevent risks for the environment? -Right at the livestock farm we clean and disinfect the area where the cow was. Transportation vehicles are also sanitized before and after the move. At the plant in Cerceda measures and controls multiply. For us collection biosafety and its treatment is one of the most important aspects. -What amount of residues do you process at the plant? -Each day we collect an average of one hundred tons of by-products in Galicia. If these residues were not processed in the adequate way, we would be provoking a great environmental problem. -Are you researching on how to make these processes better? -Yes, we are. We are working on new systems for vehicle disinfection, designing automatic mechanisms. For us working on I+D is very important. -There are moves to implant our knowledge and our techniques in other countries. It is the case of Poland. In short we expect to be present in that country and take Gesuga’s know how there.